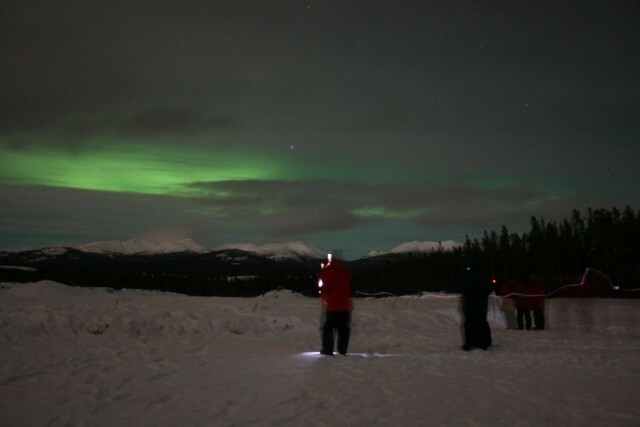 A year later I tried my aurora luck again at Whitehorse, Canada – with limited success, but at least I could play sillybillys in the snow with dogsled mushing, snowmobiling and a plane flight to see the frozen lakes. If you missed it, read the first part of Rosie’s story. 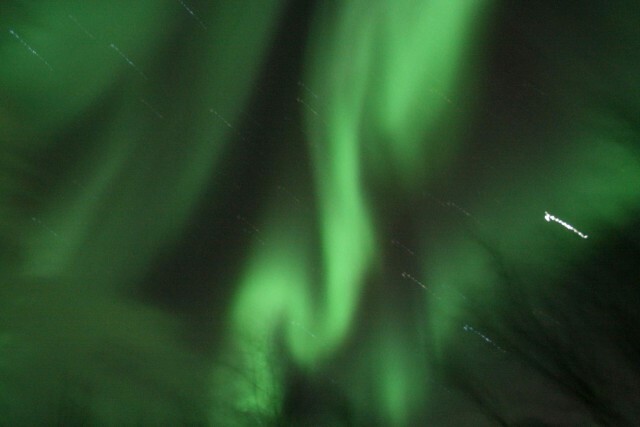 Aurora seen from Whitehorse, Canada. After an abortive Autumn attempt in Finland (where the only thing of note I saw was the inside of an A&E Dept after someone decided a night trek in the snow was a good idea) I decided to give Abisko another go on a mini-break. When we arrived at the airport we were told by an ecstatic guide that we really should have been here yesterday as they’d had one of the best auroras in years the night before! “Gee thanks!” I thought. In Abisko that evening, those having a meal at the Sky Station quickly left to catch the early chairlift up, but soon it became clear the wind was going to be an issue and that our group was not going to be allowed to go to the top. We were offered the chance of the museum or trying down by the lake to see if anything developed…. We went for the latter, and it certainly did! Twisting aurora above Abisko, Sweden. I love this pic – it looks like an MRI of my troublesome knee! We really felt for our fellow travellers up the mountain – they didn’t get to see much as they were not allowed outside the building because of the bad weather. They didn’t get back to the Hotel until 4:00 am. 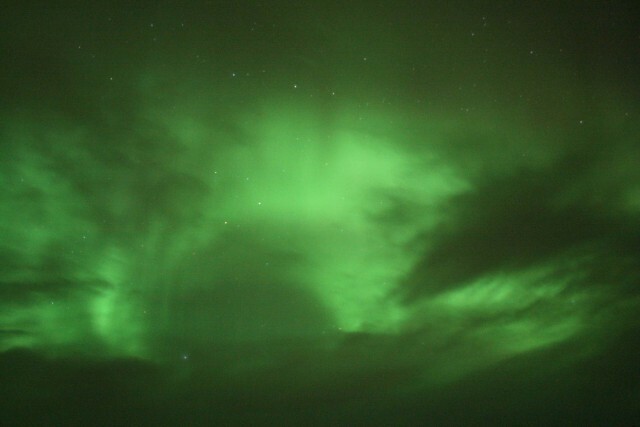 More pretty northern lights above Abisko. The second night of my mini-break was another overnight snowmobile trip to re-visit my favourite chemical toilet in the world (updated and improved!). As my guide Eric could see I knew how to handle a snowmobile, after dinner we headed off through powder snow by moonlight to search for the Aurora. 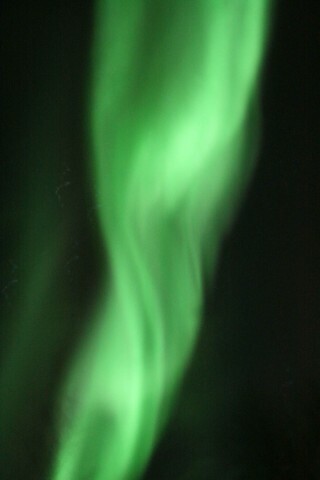 As we were away from artificial light we saw them while the folks at the Ice Hotel didn’t. 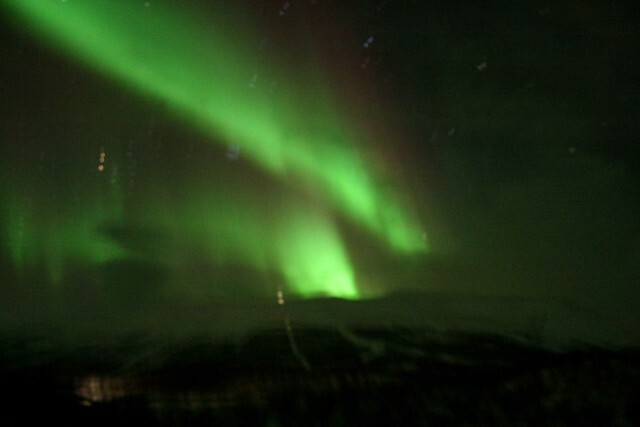 Green skies at night… aurora chasers’ delight. I’ve been hugely lucky to see the aurora on a number of occasions and now I know how and why they appear (thanks to Melanie) I reckon I will just HAVE to go and find them again! Read the first part of Rosie’s story to get the full picture of her adventures.